The links above give an illustrated version of these notes. 1. Start from Houghton Village Hall, on the corner of Stevens Drove. 2. Here is the gateway to the Clarendon Way, heading east. Shortly afterwards you will cross over the River Test. Turn left here: the Clarendon Way climbs, you want to keep on the level – the Test Way is along a former railway track. Not long afterwards there is a fork in the path – keep right! either a 30mph or a 40mph speed limit. If you do go this way you can call in at Houghton Lodge Gardens tea room; but be aware that their last orders are at 4.20 p.m. Here is the poster for the next quarterly meeting, coming up soon – Saturday week to be precise. I’ll get the agenda and the minutes of the last meeting out tomorrow, and will test the various route possibilities within the next few days. It’s all to be found on OS Explorer no. 131. Following the time-honoured format, we begin with a try-out on the interesting new ring of six at All Saints’, Houghton, then lunch (BYO) either inside or on the lawn outside the Village Hall in Houghton, where also there will be tea/coffee-making facilities and loos, and parking. Then we have a probably quite short business meeting, and walk to Stockbridge. There are three possible routes, the shortest of which is along the public highway. I am advised this is do-able but can be hairy owing to the presence of tractors, Chelsea or otherwise. 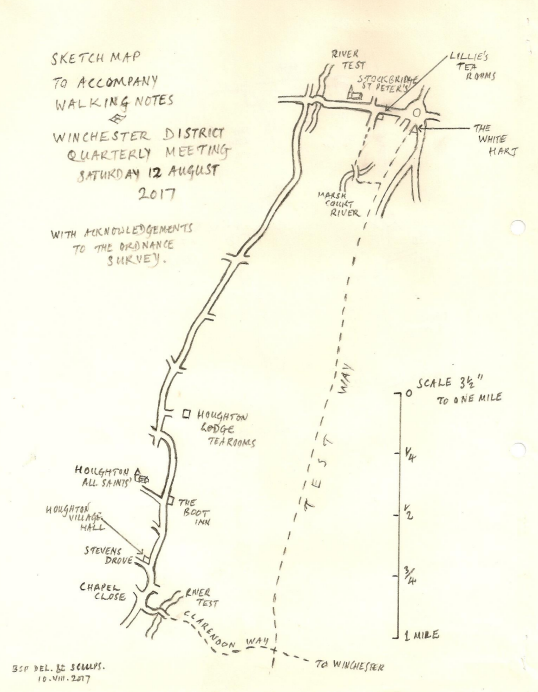 There is a longer and more circuitous route to the west over the downs, or you can make your way to the public footpath along the old railway track to Stockbridge. We ring at Stockbridge from 3.00 to 4.00, which will be a real treat. I attended the inaugural practice on the newly reinstalled six, and – apart from the hazard of the five going up wrong – they handle like a dream. Depending what arrangements you make, there are options at Stockbridge, including Lillie’s tea rooms, open till 4.45; I have arranged for the King’s Somborne bells to be available from 5.30 onwards, tho’ to get afternoon tea in Stockbridge AND make it to King’s Somborne you will doubtless need to have transport sorted out – or you could walk to KS from Stockbridge and have a coffee/tea or a drink at the pub in King’s Somborne after ringing there. On Saturday 24th October Eling ringers had their first Outing in quite a few years. Organised by yours truly, for the benefit of our newer ringers to give them experience ringing at different towers. A good day out apart from the weather!